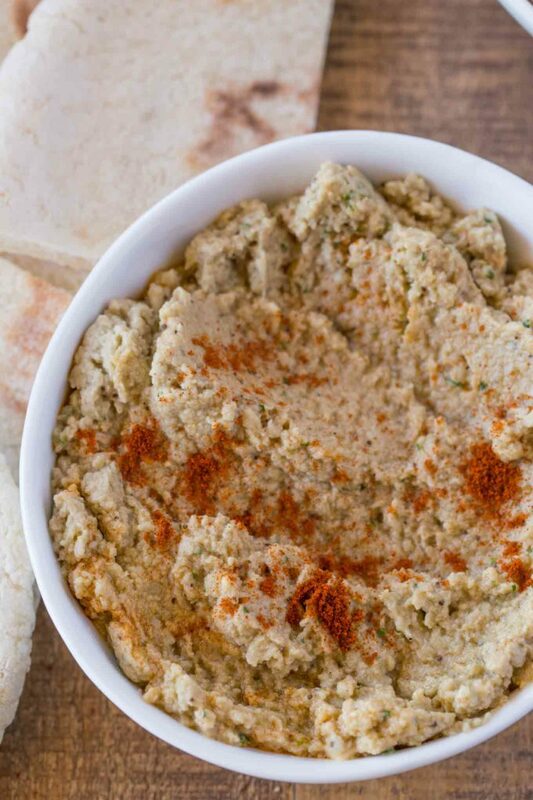 Baba Ganoush is a healthy and easy dip made with roasted eggplant, garlic, lemon juice and greek yogurt that is a great swap or complement to your favorite hummus! 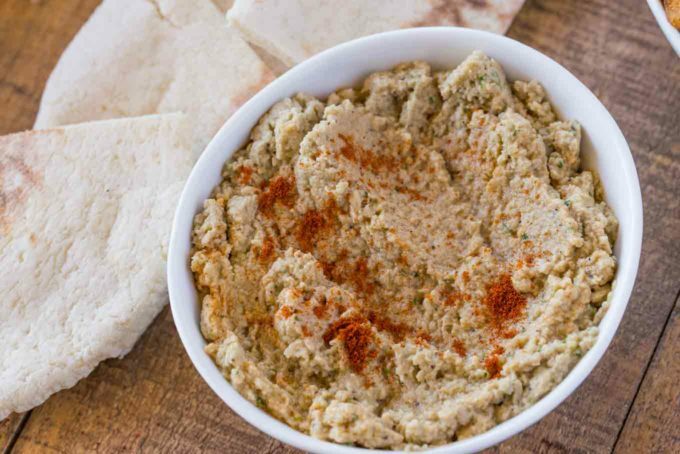 Serve up this middle eastern dip with Tabouli Salad, Middle Eastern Chicken Kebabs (Shish Tawook) or Greek Chickpea Salad for the perfect summer meal. 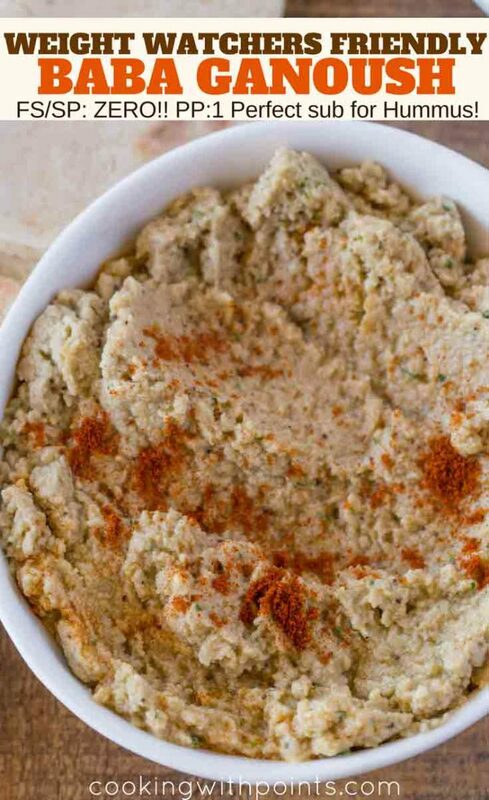 Long before Hummus was the zero point wonder that it currently is, we used to make this Baba Ganoush to replace hummus in meditteranean mezze platters as well as in falafel wraps. 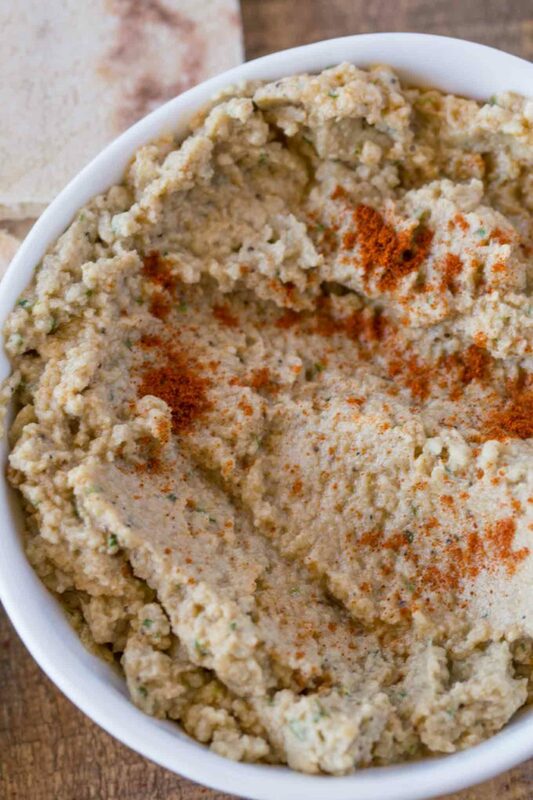 With roasted eggplant, garlic and lemon the flavors are reminiscent but lighter than the traditional hummus options. The most complicated part of this recipe (and I promise it isn’t even complicated) is the roasting of the eggplant. The first thing is we want a lot of the surface area to roast, so we cut the eggplant into steaks. Do not peel or remove the skin of the eggplant in this step as it will help keep the structural integrity of the eggplant during and after roasting. Second we are going to salt the eggplant so we can remove the excess moisture from the eggplant before roasting. You don’t have to wait too long in this process but a good 15 minutes should get the liquid out so the roasting will be easier. You don’t have to worry about de-salting the eggplant, that is the entire salt content of the recipe and will be accounted for. Once you let it cool you should be able to remove the skin quite easily, like wet tape. The seeds are not to be removed, so all you have to do is scoop the mixture into the food processor and blend it well with the rest of the ingredients. 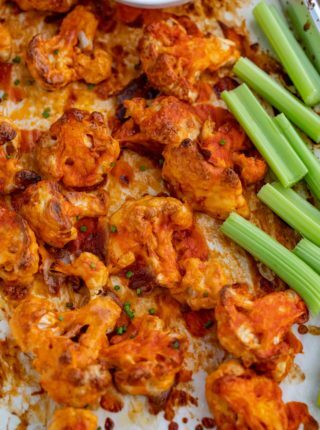 We are skipping the tahini in this recipe to save on points and to make the easier more accessible to those who don’t have ethnic grocery stores nearby. Tahini is a sesame seed paste made with sesame oil and it can quickly rack up points in both hummus and baba ganoush. If you prefer a more authentic recipe, replace the greek yogurt with 2 tablespoons of Tahini. 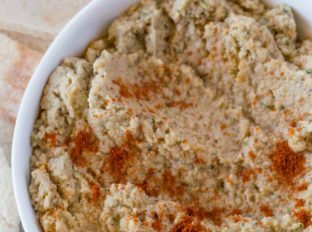 What to serve with Baba Ganoush? 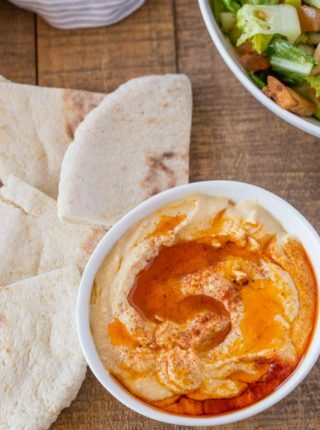 We love any grilled meats or appetizer plates with hummus, pita chips, stuffed grape leaves, kalamata olives and roasted bell peppers. Cut the eggplant into steaks or like you would tomato slices, about 1 inch thick. Sprinkle with salt and let sit in a colander for 15 minutes to release some of the liquids. Pat dry with a paper towel (don't rinse). Spray with canola oil, and place on a silicone mat. Roast for 25-30 minutes, then let cool. Remove the skin from the eggplant then add the eggplant meat and the rest of the ingredients in a food processor together until well combined. I’ve never made my own baba ganoush. Maybe now is the time. Thanks for the recipe! Yum, love Mediterranean! 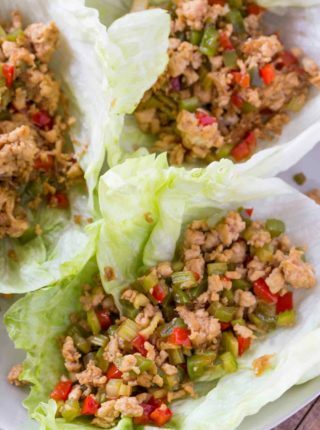 Perfect for dipping with veggies! I haven’t tried this dip! Looks amazing! I can’t wait to try! Thanks, Toni! I think you’re gonna love it! Love the lemon flavor in this! I have to try it! The flavor looks incredible! This looks delicious! This looks really good! 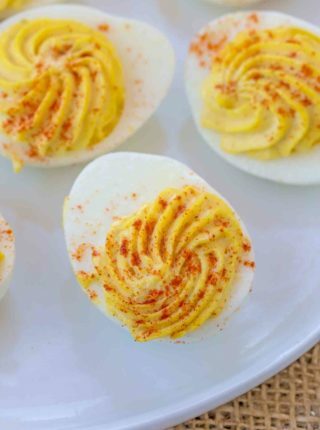 Would love to try it for our next gathering!